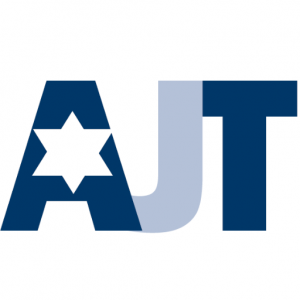 Wonderful review by Jeremy Jones for AIJAC – Australia/Israel & Jewish Affairs Council. Dina Gold is an extremely skilled writer, a talent she puts to full use to help readers of her memoir not only come to see that her grandmother was right, but also to feel that you are actually part of her efforts to achieve justice. 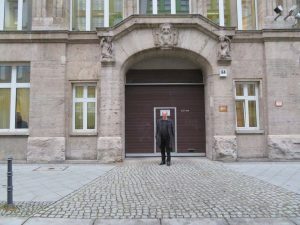 He was so enamored of the story told in “Stolen Legacy” that, when he visited Berlin, he went to Krausenstrasse 17/18 – the building he had read all about. 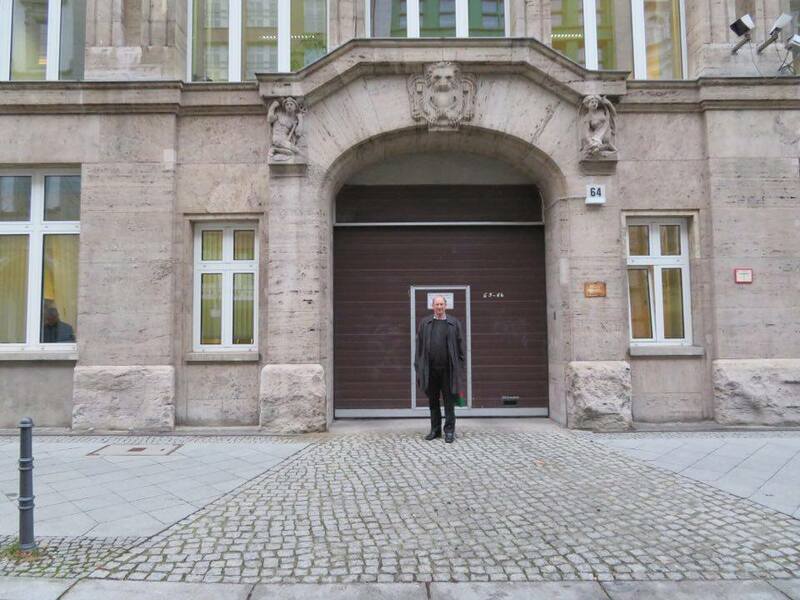 And he even sent me a photograph of himself standing outside the building’s archway. The very same one featured on the front cover of the paperback edition. Alan Freedman, presenter of “Nothing Left” broadcasting from Melbourne, Australia interviewed me for his show. You can hear it starting at 50 minutes into the program. One thing you didn’t ask her was about the movie… it’s a wonder Spielberg doesn’t get onto it… it would make a great movie. The Atlanta Jewish Times reported on the discussion panel for the opening night event launching the traveling exhibition “Fashioning a Nation: German Identity and Industry 1914-1945” curated by the Georgia Commission on the Holocaust and hosted by the German Cultural Center. The discussion focused on how Jews had dominated German fashion before World War II. As historian Uwe Westphal told the audience: creative and innovative fashion by Jewish-German designers created the Roaring Twenties. The story of the Wolff family’s fur business and what happened was part of the event. Between 1930 and 1939 the Nazis closed all Jewish fashion companies. Sadly, as Westphal explained, today’s German fashion students are ignorant of this sordid history. Jill Swenson starts her blog post with the words: It’s no secret, I like history. It offers us lessons about the future. You won’t be surprised then to hear this past year I’ve read a lot of books about the years in Europe leading up to WWII. “Stolen Legacy” is amongst the new nonfiction books Ms Swenson reviews and recommends. She is shocked at what she reads of the role of German insurance companies during the Third Reich. Not only did they play a key role in the Aryanization of the German economy long before stormtroopers forced the removal of Jews from their homes and businesses, but they had insurance policies on the concentration camps and profited nicely from the Nazi policies. She concludes: This book is a testament to dogged determination to find the facts and determine the truth. Ahead of the paperback edition of Stolen Legacy going on sale in the UK next week, the Jewish Telegraph has published this feature. Last month, the British government reaffirmed its commitment to help Holocaust survivors whose property was taken. 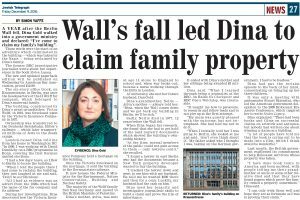 “I have done book tours in America and been mobbed, with people telling me their grandmother or uncle or some other relative died and that they have found papers which prove the family owned a property somewhere,” Dina said.